These were used for wedding favors ... I added ribbon and a charm and they brought a touch of class to each place setting. Great quality and the color is just how i wanted it. Also easy to assemble. A qualty piece, easy to assemble makes an impressive statement at a friendly price. Ordered them for my daughter's wedding. We were a little nervous on quality - but they are great! Easy to assemble (after we figured it out-lol). Great value for what you get. Highly recommend! This is probably the best purchase ever! I will use these brown favor boxes for my rustic wedding, decorated with an orange ribbon and a heart shaped tag. The size is perfect for a wedding favor and combine perfectly with the rustic theme and the orange flowers all over! These are really ease to assemble and each box holds around 10-12 Hershey's kisses....very nice touch! Simply stated boxes. I bought the chocolate brown give away boxes. I expected them to be a bit darker in color. Nevertheless the worked well for what I planned to us them for after I switched out the ribbon color and the decorative embellishment. The boxes are sturdy and once folded your recipients do not see the 'card board' color in the inside. The way in which they are constructed shows that they are nice and clean but yet not quite a Tiffany's box. I would look at purchasing these for other potential future events. They are just the right size for 12 - 18 Jordan almonds. After searching online for a reasonably priced and perfectly sized favor box I came upon Beau-Coup and am I ever glad I did. These little gems do require assembly but, they are more than easy to put together once you get going. I purchased the Ivory Linen and the Black which both have a lovely texture/finish. The boxes are quite sturdy, uniform in size and have a classy look to them. I highly recommend this product to anyone because you can't beat the value and quality. These are going to turn out beautifully when all is said and done. VERY pleased customer! Great price point. Sturdy construction, and easy to put together. Will be great for holding the favors for my daughter's 16th birthday party. Perfect little box to put hershey's kisses in. Easy to assemble. Good quality. Boxes were a huge success. After we finally figured out how to assemble the boxes, they were extremely easy to put together. Deeper than expected! Highly Recommend! I ordered these cute boxes to be used for my wedding place card and favor box! I am having my guests' names written in calligraphy on the box top so this truly will double at a place card and my favor box, plus it will be a cute keepsake since the calligraphy will look beautiful! I was impressed with the depth of the box, I wasn't sure (even after measuring it out myself) how deep it would truly be in person, but I will be able to fit some wonderful favors in there for my guests! The price is unbeatable especially since this box is not flimsy whatsoever! Highly Recommend! These boxes go together easily and look fabulous. I used these boxes for both a 50th Anniversary party and a 70th Birthday party. They are easy to personalize with ribbon and tags of your choice. Perfect to fill with gourmet chocolate. Classy and elegant, they go well with any party. These were perfect size. Color that I picked matched perfectly with the theme. Easy to put together. The favor boxes add a touch of elegance to the tables. I tied silk ribbons on them and they were stunning! The favor boxes worked very well with our wrapped mini Hershey bars. I received many compliments from our guests at the Bridal shower. Perfect sized gift box for small candy! Great favor idea and perfect to decorate with ribbon or personalized stickers! Very happy I came across these to use as favors! I also like the texture of the box, doesn't look like a cheap cardboard box (I bought black color). Easy to assemble as they do come flat! Definitely would recommend to others to purchase! Filled box with homemade butternut crunch for daughters wedding. Looked so beautiful on the tables. Put them together by myself was a bit time consuming had to make 230 tops and bottoms but was worth it when I saw them at each place setting. Would purchase them again. 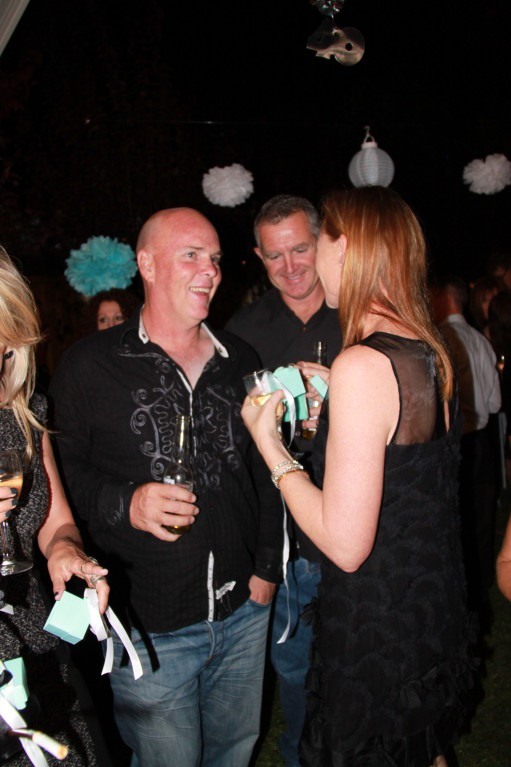 I had a Breakfast at Tiffany's themed 40th Birthday party, which was a huge success. I wanted as close to Tiffany blue boxes I could get and these were. I gave each guest a ribbon tied box with a ring that had Audrey Hepburn on it, also a personalized gift tag. It was amazing. Beau-coup are prosfessional and efficient. Don't hesitate using them they were great. I live in Australia and I will use again and again. I have been looking for favor boxes all over the place. Most of them look cheap and fragile. Luckily, I came across beau-coup. I am so happy with my purchase! The box is beautiful and sturdy and the quality is great. And it is pretty inexpensive! It was exactly what I wanted and more. I am very pleased with this Favor Box. It goes well with my color theme and will be used to set onto of the plate at the tables. Thank you's so much. I made favors for my cousins bridal shower. I put labels and ribbon on them and filled them with chocolates!! They looked great! I used these boxes for wedding favors. I filled them with chocolate truffles - 3 fit perfectly and I tied them with personalized ribbon (brown with gold lettering) - also excellent quality! Even looks neat on the inside! I had a client that wanted my handmade soaps for her daughters bridal shower. She gave me the invitation and I matched the colors to the boxes. The top was teal and the bottom was brown. She was so pleased and after the event she told me how everyone complemented the favors. The boxes were just perfect and easy to assemble. I'm having a my wedding on the beach. I will be using these as one of my favors. These will be lined and filled with chocolate sea shells. I have the perfect coordinating ribbon for them as well. I couldn't be happier with my purchase. The product is not been used yet, but will be on September 3, 2011. Being used for cream cheese mints as wedding favors for each guest. I got this box for my wedding favors. I'm so glad i got it, because look so cute and the finish is great. Look much better that i was expecting. These boxes are big enough to hold a good amount of candy for my wedding guest. The pink boxes were the perfect color and assembly was easy...just takes a little time. I would recommend buying a ribbon with it, the box looks plain just by itself. The quality of this product is exceptional[...]! I would highly recommend! Instructional videos were very helpful. they say simplicity is next to elegance and these boxes definitely fit the description. will be using them for my wedding and family and close friends who saw them have already commented on their (boxes) beauty. Thank you beau-coup! A perfect little touch of color for the party table or Guest bag. Tie on a little ribbon for added flair. I ALMOST BOUGHT A LOOK-A-LIKE BOX FROM A LOCAL STORE, AND I AM SO GLAD I DIDN'T. THESE BOXES ARE A LITTLE PRICEY BUT THE QUALITY AND APPEARANCE OF THESE BOXES SURPASSES ANYTHING I HAVE SEEN OUT THERE. THE INSTRUCTIONAL VIDEO WAS VERY HELPFUL IN SHOWING HOW TO PUT THE BOXES TOGETHER. THEY ARE A GOOD SIZE TO FILL WITH CHOCOLATES. I ALSO MADE TAGS AND USED DIFFERENT COLOR ORGANZA BOWS ON THEM FOR OUR WEDDING RECEPTION. YOU CAN'T GO WRONG HERE! These are not close to being white! If you must have white favor boxes, do not order these. My daughter's colors are white/black so the ivory just stands out. The quality if very good and I wish I could keep them. I just received my "White Quilted" boxes and my only complaint is that the color is not white, it is ivory. I expected them to be white to match my wedding colors. I will end up using them anyway as favor boxes to hold our favorite candies, but I just wish I had gotten what I thought I was ordering. Other than that they look elegant with the quilted pattern and they are easy to assemble, it just takes time. These looked more difficult to put together than they actually were. Fit four truffles in each box. These boxes are sturdy,easy to assemble,and very pretty as well. They can be used to hold just about anything that fits one's theme. In the case of Italian wedding party favors, they can hold tuelle-encased almonds for a dressier, more gift-type appearance. The textured look is very elegant and looks beautiful with a silk or organza ribbon. Super easy to assemble. The GOLD color is grand. Will hold the perfect serving amount of Choc. Espresso Beans for each guest as favors. Definite do again on future special occassions. I'm glad I ordered samples. The ivory color is fine, slightly yellower than I thought though. We're planning on giving out chocolate covered fortune cookies and while I love the two piece element of this gift box, the fortune cookie doesn't fit. It's perfect if your favor is smaller. I used them as favor boxes filled with Jordan Almonds at my Key West Wedding. The brown boxes looked great with my tropical light orange, turquoise and brown theme. They were easy to assemble and because the top and bottom are separate pieces, they connected together and STAYED together. Other favor boxes/containers I tried would pop open after you built them. I made my own personalized "Thank You" tags and tied them on with beautiful ribbon that I also purchased at this site. I was very happy overall and would use this company in the future for other events/parties. The boxes are great. I mix Brown and Blue, my favors are shot glasses. The boxes are small but I made it work. I purchased the boxes before i even knew what my favor would be. i will be using the favor boxes at my son's wedding reception. The boxes are sturdy, yet look so elegant. Two people I showed the boxes to before the wedding, said they would take the box without any candy in it. I loved the boxes, so beautiful, thank you. These will be favor holders (kisses) for the reception, tied with matching bows. They look fantastic. Easy to store before folding, easy to asssemble. Very pleased! These black boxes were easy to assemble, every one of the 160 boxes were usable; would recommend them in any color for wedding table favors. It was perfect for our beach wedding!! This looked awesome on our tables at our wedding! This was a great box for what we needed. The only down side was you had to put them together. Other than that they were perfect. I would definitely recommend. A wonderful gift for a friend..
i used the product as a wedding favor filled with chocolates for my friend's wedding. The crowd likes it and she likes it too. it was heart taking. the colors fits her wedding theme and the size fits perfectly for the chosen chocolate..
Great to mix and match with other colors! I used these boxes (wrapped in ribbon) as the container for favors for my sister's shower - they worked great and look wonderful. No instructions were included - but it wasn't hard to figure out. They were perfect for storing wine charms and hershey's miniatures. This was very easy to assemble and the perfect size to fit those square little chocolates! I ordered these for my favors for my December wedding. I mix n matched the black and white quilted patterns. After watching the video on how to assemble them, it was so quick and easy! They are a good quality and I know they are going to look fabulous on the tables at my December wedding. I loved them so much that I changed my wedding favors to something that would fit in the box! It also keeps things neat. I used this product to put jewelry in for all of my bridesmaids. It was very cute but I thought the ribbon was included and it wasn't. They are very cute but nothing to rave about. These boxes were great! I used them as favor boxes but they also doubled as part of my centerpiece. I also personalized them with a sticker label that I made myself that was color coordinated to match my wedding. 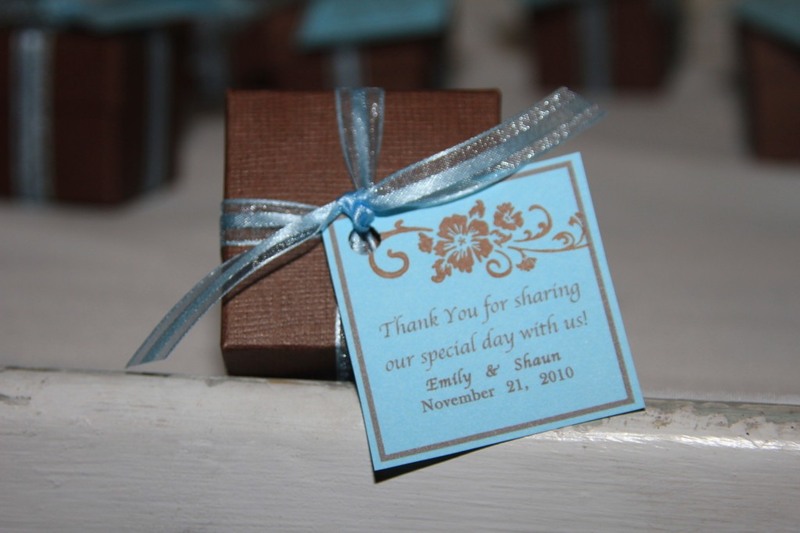 These made beautiful little favors for the wedding day, we put on every place setting, tied them up with a white satin ribbon and filled with little chocolates, then put little tags on them that said thank you for sharing our special day. They looked just like Tiffany Boxes. Everyone loved them. Just wish they were a little less expensive that was my only complaint. Erica a zillion times a bridesmaid! Not only was I SUPER pleased with the quality of the product [...]I HIGHLY recomend this boxes and this company. Wish I had found this company about 10 weddings ago! Each box is perfectly square, no uneven corners as I anticipated. The mix and match choices in small quantities fits my attention to detail~ I love them! I was very pleased with both your website quality and pricing. [...] Your product was one of the first things I bought and it surely made me even more excited to plan the rest of my wedding. Very fun! I am especially pleased on the quality of the product and how easy it was to assemble the boxes. I ordered about 200 silver metallic boxes for my favors and only 1 out of the 200 did not have a lid to go with it. Not bad. :) Thank you Beau-Coup! These boxes were perfect for the bridal shower I had. The box was the perfect "tiffany's" color and was constructed well. I would definitely reccomend this product to anyone! Great for a favor. They are easy to put together and the texture really makes them look nicer than most favor boxes. We added small mints in tulle and placed in the boxes. We tied the boxes with the theme color. These boxes are elegant and easy to construct. The quality was better than expected. This box is very beautiful! It is going to look so elegant for my bridesmaid, mother, and grandmother gifts on the day of the wedding. It is perfect for a small brooch or other piece of jewelry. 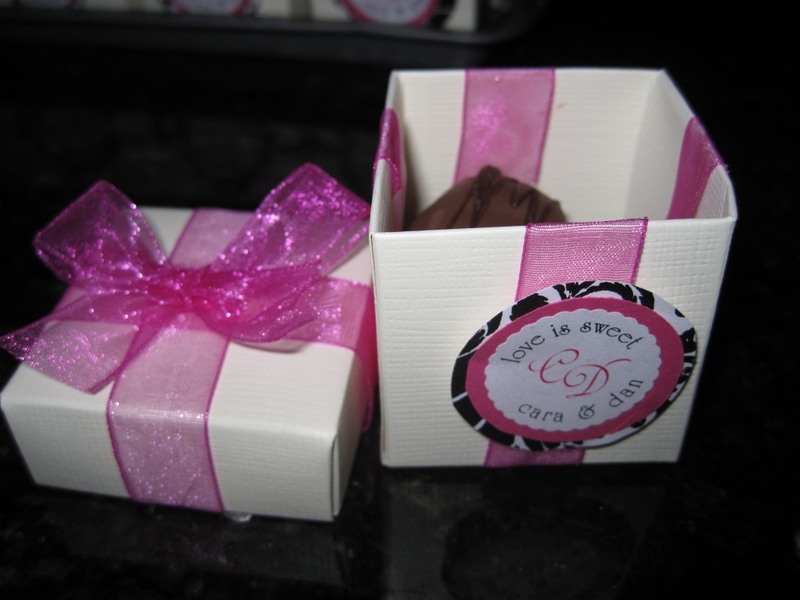 These boxes were a perfect shower favor filled with Hershey hugs and kisses and tied with a pretty ribbon! I will be using the black boxes for wedding favors at my sons wedding in Nashville on 5/16/10. I will be putting hand decorated cookies inside with ribbon and a tag on the outside. I took a picture of the finished product and sent it to my future daughter in law she loved it!! I will be hand carrying the unfolded boxed on the plane and assemble them in Nashville, I love their size, all 60 boxes can fit in my purse!! I definitely will use again for another event. Thank You!! I bought the ivory floral boxes and we are going to put french macaroons inside them. They really are elegant paired with the personalized labels. We bought these for my upcoming wedding. They are extremely easy to assemble (check out the video!) and they are made out of thick and sturdy materials. I bought the Aqua Blue and Black boxes to intermix the colors. The aqua was a little lighter than I wanted, but still do-able for my colors. I also wished they were a little bigger. However, I knew what size and color they were when I ordered them. They were very easy to personalize. Will be used as a wedding favour, filled with chocolate almonds and set at each place setting. A beautiful ribbon wrapped around the box will set it off beautifully. I'm using these boxes to put chocolate covered oreo's in. They were the perfect size and the price was just right. The color matches perfect with our theme. So glad I found this website. These were a little extra to place at everyone's place setting at rehearsal dinner. The bride & groom's new monogram was imprinted on a seal and attached to each box, filled with gourmet candies. These little boxes are perfect for wedding favors. Good quality and very easy to assemble. This was a unique product that everyone loved and wanted to take home as a keepsake, even the men wanted them. Just remember that when you purchase them, you have to put them together. Top & Bottom come flat. I did them as I watched TV since I had 30 to do. I put candy in them and put them all around the coffee tables etc as somewhat centerpieces. Beautifully constructed boxes are easy to assemble and are very elegant. I wanted to give each guest the feeling of getting a little present, with these lovely boxes all it took was a simple ribbon tied in a bow on top and it was beautiful. Everyone loved them! They were a nice finishing touch for our reception. Excellent and good quality. They were the perfect size and very sturdy. Easy to put together. We had a gift opening party for our son and daught-in-law and used these boxes as a party favor with chocolates inside.They where a perfect size and looked very nice.They do require assembly which is the only down side. Very cute but ribbon was an extra cost and it was time consuming to put together. The best features were the quality of the box and how seamless it was when assembled. I bought these for a Tiffany-themed holiday party. While they're not exactly Tiffany blue, they are very adorable and easy to assemble and they're completely blue inside and out. My guests loved them. I used these favor boxes for our engagement party (we put cake truffles in them). I ordered them in a linen finish which had a lovely look to it. It takes some time to assemble these, but with two sets of hands it wasn't that difficult. I added my own ribbon and custom monogram to them and they were a huge hit! I would definitely purchase them again. These cute boxes added a special touch! [...] The boxes were very easy to assemble. The color was perfect. What's great about this is you can mix and match the colors as shown on the website. And adding labels really gave the boxes a personal touch. All the ladies at the bridal shower loved them. What I received is exactly as described online. They will work perfectly for my upcoming wedding. I use those for my wedding favors. Everyone loved them! I got the ivory linen and the look is very, very nice. Excellent quality and the size was good. I put 3 chocolate truffles in and wrap nice ribbon around them.[...]. I'll buy them again. This product made a very beautiful decoration at our bridal shower. Everyone thought they were gorgeous. We filled them with wedding covered almonds. This was the favor for a Tiffany & Co. themed bridal shower for my sister. 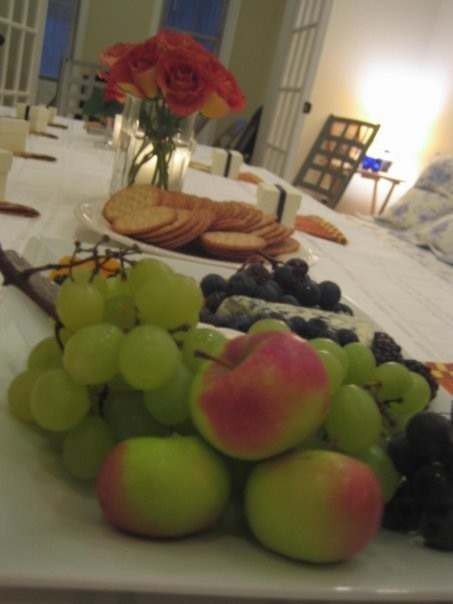 She loved it and the guest raved that it was the perfect favor for an absolutely fabulous party. I'm using it as favor boxes for my daughter's wedding. We are placing a petit four (bite-size cake) which fit perfectly in the box. 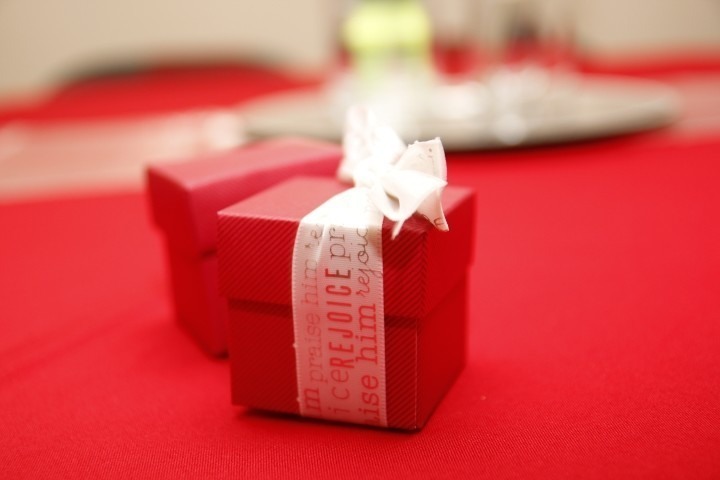 Once the ribbon is tied around the box and the tag is in place, it will make a perfect favor for our guests. These boxes made great wedding favors placed at each person's dinner plate. Our son and daughter-in-law wanted a tasteful, modern favor and these definitely provided that classy elegance. We used the box for the shower favors and they were great. It would have been nice if they were an actual box that did not have to be put together, but they were easy to do. I will definately order again from you. What I was hoping for and more! I was looking for a gold box to use with M&Ms for my wedding favors. These were perfect! They were easy to assemble, and they fold inwards so the inside is as pretty as the outside. This meant alot since after seeing them, I realized I didn't need to put in tissue paper or anything on the inside, they were just right as is. Perfect for a wedding favour! The color of these boxes matched my cousin's bridal theme and were perfect for the bridal shower favors. I included candy inside and bought white ribbon to finish it off. I used these boxes as favors for my wedding. I filled them up with chocolate cremes and tied a purple and gold bow around them and they looked beautiful. Yes you have to assemble them but it is not difficult at all, with the help of my family it was pretty quick. This is a great little box. First, the box and lid come flat and require assembly. This was fun to do! (I love to put things together). I used my boxes to hold one exquisite piece of chocolate, as party favor at a bridal shower I held. I lined each box with tissue paper and tied it with a matching organza ribbon. They were adorable and much appreciated by the guests. 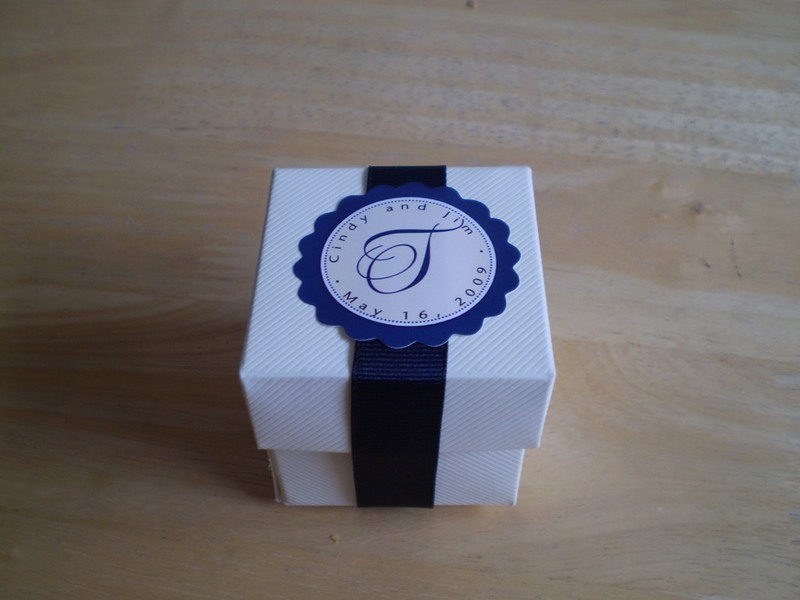 I love these little boxes, and I am using them as wedding favors. I could choose the colors of my wedding and they look great! They are the perfect size for holding candy. I used these darling boxes as party favors for a surprise BD party for my mother. I filled the white embossed 2x2 boxes with jelly bellies and tied them with wired green and yellow organdy ribbon. Everyone commented how very attractive they were. The plates, paper fans (also used as favors), napkins, ect were all color coordinated which made the boxes look even nicer. I used the fans and ribbon tied boxes, along with packaged mints, as table centerpiece decorations telling everyone to take a set home as a "thank you for coming" gift. The cardboard boxes were simple to put together and were nice and heavy. Will DEFINATELY purchase them again for another occasion. These boxes were awesome, and NOT flimsy. They worked perfectly with my favors. These boxes have a quality feel to them since they have some texture. I was concerned about their size as I am using them for jordan almonds but they are definitely big enough to fit at least 5-8 almonds. The biggest con is the assembly- it just takes some time to get them put together. I purchased the lime green ones and they are a very nice color. Excellent product, would recommend for wedding favors. [...] they where really a great addition to the wedding favors. Perfect ! Our Guests love them ! Perfect for any event! I used them for my sister's,my cousins' & my wedding, it was a great success!I would order them again for future events! This is a great favor box for weddings. The quality is great. We mixed and matched black and linen tops and bottoms. They look perfect. The only con is sometimes the black rubs off onto the linen, so you have to be careful when assembling. "Love, Love, Love these boxes!" I am using these as favor boxes in my wedding. They are going to bring an elegant look to the tables. Using these boxes for wedding cake. They are easy to put together. Look and feel elegant. very very attrictive boxes.could have been a little bigger to put a gift inside.not just candy. The Box as indicated was a bit small, but the quality was excellent. I wish i had them when i was getting married. I think this product could be used not only as a cake box, but as a token box too. Really great for presentation. [...] I was happy with the easy set-up, although, it took me a while to figure out how to set up the boxes without a diagram explaining it step by step, however, I did manage to figure it out.The prices were not that bad. The boxes were cute and perfect, but I thought that I was getting the black box and white lid. Our guests at the wedding were very excited about their gifts! this little box was the perfect size for my wedding favors. I am filling it with jordan almonds at my Christmas wedding and wrapping it with a bow like a little gift. They are great! Can't wait to stuff these wonderful boxes with pieces of chocolate truffles! Love these favor boxes! Add a ribbon and they are a beautiful addition to a set table! This box was really good quality and the color was rich. The box is textured which I didn't expect but was very pleased to receive. these boxes are really cute! the boxes are the perfect touch to dress up the table and a nice way to give a gift on a budget. i filled them with chocolates and dressed them up with bows. These little boxes are a great way to make a big impression. They are classy, very cute and will compliment your wedding reception with bright colors. I bought the assortment of boxes (different bottoms with different tops) and loved how it turned out. I was really impressed with their durability, design and easy packing capability. We are using these boxes for our wedding favors. I had seen them and loved the idea. We will be putting English chocolates in them for our November wedding. Great product, I'd purchase again. The product itself is great. Basic and easy to work with. The ONLY complaint I had was the color it was a little more beige than I hoped but it was NOT a big deal. My fault for not ordering a sample before I made the final purchase. My wedding favors still turned out great! Simple, clean...I would definitely recommend this product. Thanks Beau-coup! Perfect favor holder for my wedding. Simple and elegant. The linen texture made it not boring without seeming out-of-scale for such a small box. These boxes are perfect for favors and the quality is nice. They are thicker than others I've seen. I received my boxes quickly and was suprised by the good quality. They are made of a heavy linen cardstock and really durable. I love them and am happy I decided to use these as our wedding favors! The boxes are very easy to asemble and they feel very strong. They also look very elegant, which is exactly what we were looking for. 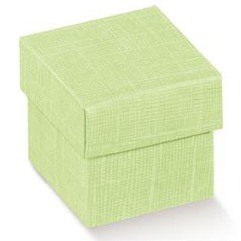 I bought the square embossed favor boxes in linen for my wedding reception. They were [...] packaged nicely. The boxes themselves are beautiful and are made with a high quality material. It looks exactly like the picture. I think it'll give a very elegant look to the wedding reception and I can't wait to use them. I'm so happy I found this item! Exactly what I needed. Filled with monogrammed M&M's...a touch of class next to frivality and silly...and wrapped with the delicate organdy ribbons, it made an elegant and fun table setting. This product fits the description that Beau-coup makes perfectly! They are beautiful and offer a classy look. I was a little hesitant to buy the boxes on-line because I thought 2x2 would be too small for my chocolate almond favors, but they are perfect. They are also quality material and easy to put together. I also bought the personalized stickers and ribbon and they really look great. They will be placed above each place setting for dinner. I was looking for a high quality favor box and the aqua blue boxes I found through your website were the best! I did my research and shopped at the craft stores first and the boxes I saw didn't measure up. I did have to assemble them but they were very easy to put together. Thanks! I ordered these boxes in my wedding colors; teal and brown. They require minimal assembly, and they are truly adorable. Can't wait to see them on my tables! Perfect for wedding favors: pretty and not cheap looking. I really liked the detached lid on this box and the quality is great. Ill just ordered a bunch of these to use for my wedding favor. also, the price was good and I liked how I could order a sample to see it before I ordered a lot for the wedding. Our gift favors turned out great. I mixed and matched the brown and gold boxes to match our wedding colors. We filled each box w/ M&Ms and our guests loved them. I got the ivory pin stripe box to use as wedding favors at my May wedding. They will hold 3-4 chocolate Lindor truffles. I will accent with the labels and assorted color ribbon. I ordered three types of labels, in the same color as pictured and they all turned out nice. Everyone who has seen my mock up (pic) thinks they are adorable. I purchased these favor boxes to hold the chocolate covered raisins that I will be giving my wedding guests. I love the way these look, the ivory/floral embossed pattern matchs the garden theme and colors of my wedding perfectly. Small but cute... not sure exactally how I will use them. They were not quite what I thought they would be, but cute in any case. These boxes are durable and have an expensive look. They are perfect for our wedding reception favors. The delicate floral design makes them unique. I will be using these boxes for me wedding favors. When I reveived the boxes the color was nicer than expected. The boxes were easy to put together. 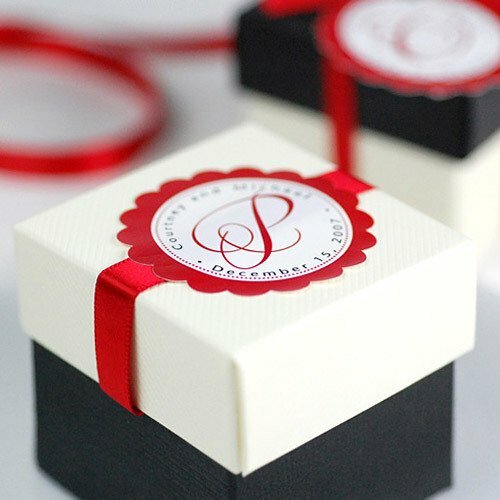 I choose a personalized burgundy ribbon to coordinate with the boxes. The colors look great together for a fall wedding. I used this product for my wedding favors and I loved them! These boxes will hold chocolate almonds for wedding favors. They are elegant. Great and easy to assemble. I got these for my best friends bridal shower. The boxes turned out very well! I would suggest to include some instructions for those who may not be as crafty!!! These adorable boxes will be favors at my daughters wedding. Color choices are great very classy. They were easy to construct. These favors are great! I am looking forward to including them in my wedding decor. These were great for my wedding favors. Although I chose a box without a lid, they were a great size and were very durable as well as attractive! I used these boxes to hold 2 tea light candles for my wedding favors. I tied each box with a piece of rafia and they looked really cute. would def buy again!! PERFECT!!! it was actually a bit more expensive than but the boxes were just too cute. Would buy item again and again!! This item made our reception extra special. Filled with chocolates made a great wedding favor. We would definitely recommend buying on you most joyous occasion.. The boxes are cute and are perfect if you are looking for casual favor boxes (i.e. they aren't super fancy). They definitely need a ribbon or something "extra" on them to look completely finished - which I used. For my pusposes -- wedding favor boxes -- they were perfect. The material is also nice. Very cute boxes that I was able to decorate beautifully for my sister-in-law's wedding. These boxes were easy to assemble and they held shape very well. Very durable and the texture and quality stock gave them a rich feel. I used the boxes for wedding favors. Everyone thought they were very cute. These boxes were great, but work best when you put something heavier in them so that they sit perfectly straight on the table. This was a beautiful addition to the tables at our daughters wedding...we filled them with mints and decorated with personalized ribbon. The boxes are very cute. Takes too long to put one together, though. This is great for wedding favors, but you might want to put heavy favors in it, so that it keeps the shape. Affordable, big impact, well-made boxes! These boxes added the perfect color punch to my event table, were easy to assemble and very attractive. They were also incredibly affordable and well-received by all 350 of the event guests! The favor boxes were so unique as we could not find anything else of a similar quality finish in our wedding colours. [...]were beautifully presented and in excellent condition. Guests commented on the two tone look(different coloured lids)and this was very effective. Thank you! These boxes are beautiful with that "polished" finished because of the embossed lines. the boxes will be perfect! We are excited about using the boxes for favors at our upcoming wedding. I used the white quilted box for my wedding candy for favors. everyone loved the boxes. It was an elegant addition to the tables. My boxes were very affordable and elegent, all i did was add my accent color ribbon. I used the all black box to hold our wedding favors (chocolate covered oreos!). A few of the pieces were defective and could not be used. I was also disappointed that I could not order the lids and bases separately. Other than that they turned out beautifully and only required some family help to assemble. Great Box at a Great Price! I purchased 100 ivory floral boxes, along with 100 personalized labels, to place my wedding favors in. The pattern on the box was much more attractive than I had been expecting--it's a lot more "rich" than depicted online. The box was also suprisingly larger than expected. The only minor drawback was that it took a little fiddling around to get the bottom flaps of the box to stay together (the boxes come flattened and you have to "assemble" them but they are very simple to put together). All in all, a stylish and affordable way to package your favors! These little boxes were used for some candy at a wedding and were very easy to put together. I would order them again for future events. The size was perfect, not too big or too small. True Tiffany blue color. Texture added a rich touch. Beautiful and classy...sure to impress! I use them at weddings for butterfly releases. I own a butterfly farm and each guest is handed one of these boxes, containing a beautiful Monarch butterfly for them to release at the end of the ceremony. I customise each one with a beautiful silver or white satin ribbon. Everyone loves them! We used these boxes to hold favors (home baked cookies) at my daughter's wedding. We tied them with ribbon and placed them at each place setting. They were perfect and we received many compliments. This is the best in the world!!! I use the product in my wedding to give my attendings a delicate piece of cake in my beautiful boxes. I used these boxes for my daughter's wedding favors, and most recently for a friend's wedding shower. The boxes are elegant looking and the perfect size for a truffle. These boxes were nicer than i hoped. i bought them as favors for my wedding. The box folds in a way where you can't see that it has been folded together...it looks more solid. That's the best way i can describe it! very nice! We used these to place personalized chocolate truffles in and wrapped the box in with an elegant ribbon to complement our wedding colors. We received numerous compliments. We used these boxes in gold for our wedding favors. We had personalized chocolate coins that we inserted in these boxes and then wrapped with a ribbon and charm. They worked great and looked wonderful. I really like the boxes and the color went very well with my wedding color scheme. I am using this box to put petit fours in for my October 2008 wedding. The petit fours are expensive, so I was thrilled that this box was not only pretty, but very sturdy to protect my little cakes! These favor boxes were great! I ordered the gold colored ones and they looked so elegant at my wedding. They were extremely easy to put together and very durable. They hold the perfect amount of candy (I used jelly beans). I actually am using ones that I had leftover as boxes for earrings, hair-ties, etc. Q:In the 4th thumbnail picture (the white top, black box with red ribbon) what size is that sticker, 1" or 2"? Thanks! A:The label is 1" for this item. Q:what is the width of the ribbon in the photo? A:The width of this ribbon is 3/8". Q:Does the boxes come in Navy Blue and Silver Ribbon? 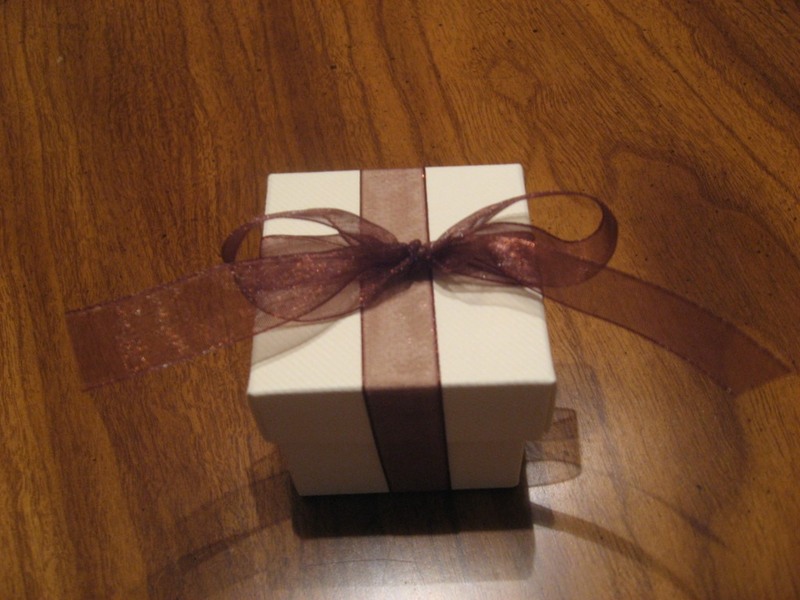 A:Our boxes do not come with ribbon, though we do sell silver ribbon on our site. We do not have these boxes in navy at this time. Q:In the photo, what is the approximate length of ribbon used for each box? 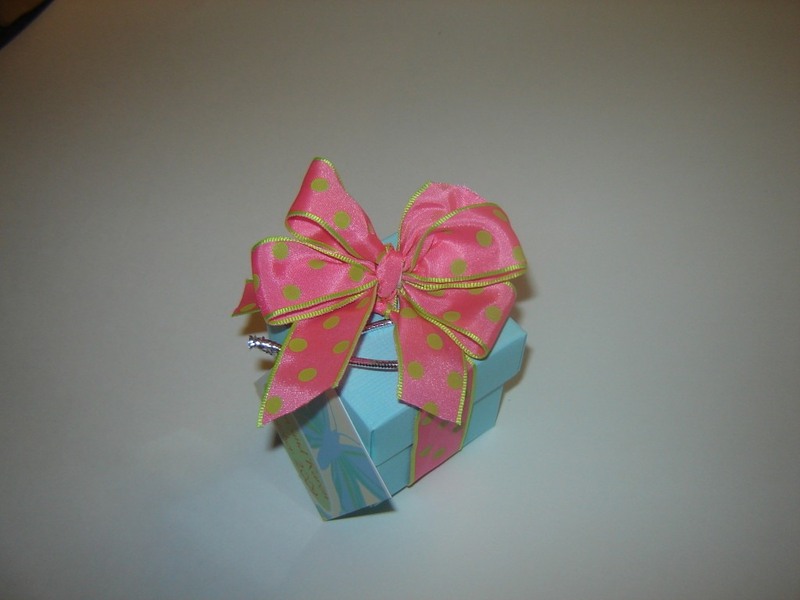 A:To tie all 4 sides with a bow for the 2" favor box it will take 30" of ribbon. 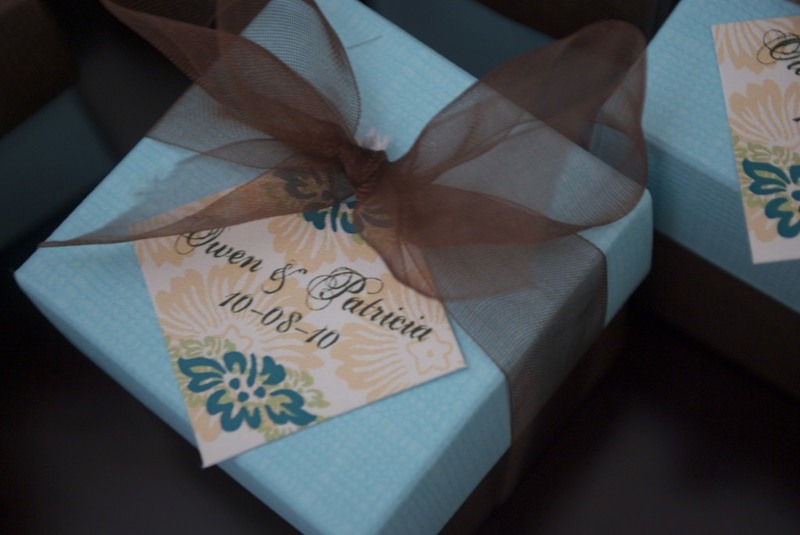 Q:Is the silver 2 piece square favor box available in 5.5"W x 5"H? I need 60 complete boxes. Q:Can I get these boxes in 4 and 6 inches of sizes? A:We only carry these boxes in 2" by 2" size. Q:Hi , may i ask is the ribbons fixed or can i change the colour of the ribbon . A:These boxes are sold and will arrive without ribbon. A:The boxes are sold plain and do not come with ribbon. 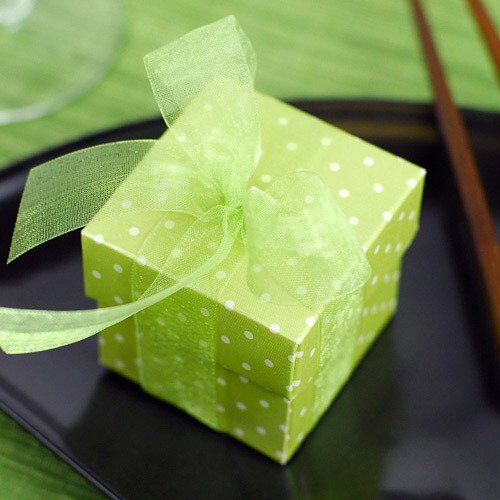 These elegant favor boxes are perfect for just about anything. Fill each with traditional candy or a small but meaningful trinket. Choose from several colors and patterns and even mix and match tops and bottoms to create your own combinations (see images to the left). Please note that each box comes with matching top and bottom and that you will have to purchase a separate set of a second color in order to mix and match. We import these original favor boxes from Italy so you are sure to have the highest in quality. Each favor box measures 2"L x 2"W x 2"H and comes with a separate lid. Sold in sets of ten, assembly required. Boxes arrive flat and some assembly is required.